After an absolutely breathtaking cruise down the Lysefjord, we disembarked the car ferry at the tiny village of Lysebotn which is visited by thousands of people each year as they prepare to hike to Kjerag. (Joe has been nagging me to do this hike but it's apparently twice as long and twice as difficult as Preikestolen and I've been stalling. The photos of the top are pretty famous - check one out here.) 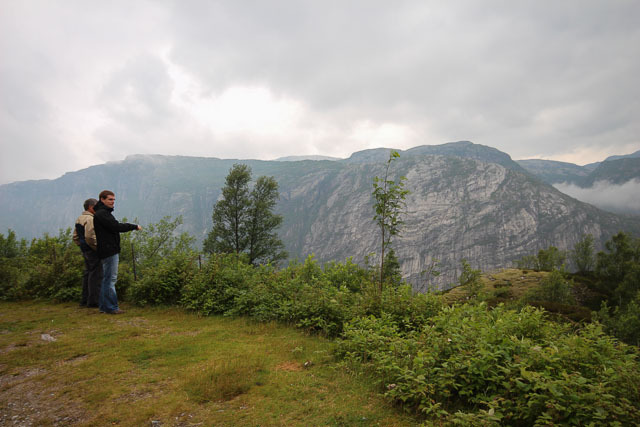 While the area is mostly famous for the incredible hiking, it's also well known for the Lysebotn road. 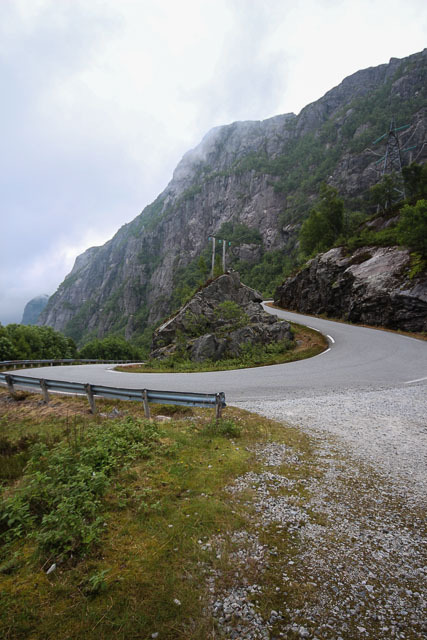 One starts at sea-level and then climbs the wall of the fjord some 3057 feet by snaking back and forth through 27 hairpin turns. I know, I feel a little nauseous just thinking about it. Known to get carsick, I started taking ginger pills first thing in the morning but I was really more concerned about my Mom, who is terrified of heights. 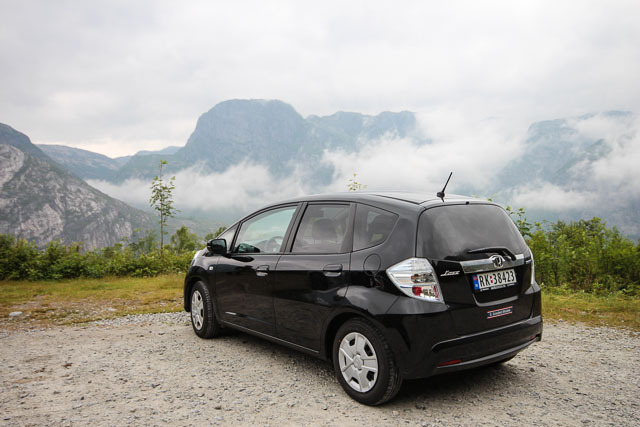 Mountain roads in Norway are narrow, busy and rarely include guardrails and the idea of climbing to such a height had me worried that we might give my poor Mother a heart attack but her luck prevailed. Heavy fog enveloped the fjord as we started the drive up allowing us to see far enough to drive safely but not enough to see over the edge of the cliffs. 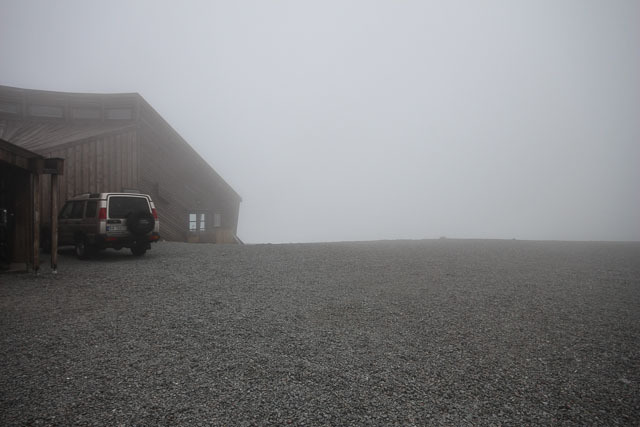 In fact, as we arrived at the Kjerag cafe, a restaurant & parking lot that serve as the base for the hike, we were in such thick fog we had a hard time manoeuvring through the parking lot. It should have looked more like this. We pulled in for lunch and had hopes that the fog would clear enough for us to take in the views from the dining room and it's balcony that skirts the building but alas, the only thing we saw was white. My Mom's relief was evident, as was our disappointment. Next time. Definitely lucky to have a next time. The road closes in the winter but we'll definitely make an effort to get back next year! Well, I didn't feel sick along the way so perhaps that counts for something! It's probably one of those things that's as much in the head as it is in the stomach! And I've so seen that picture on pinterest. I would so want one but I'd be terrified beyond belief standing on that rock. No ways. 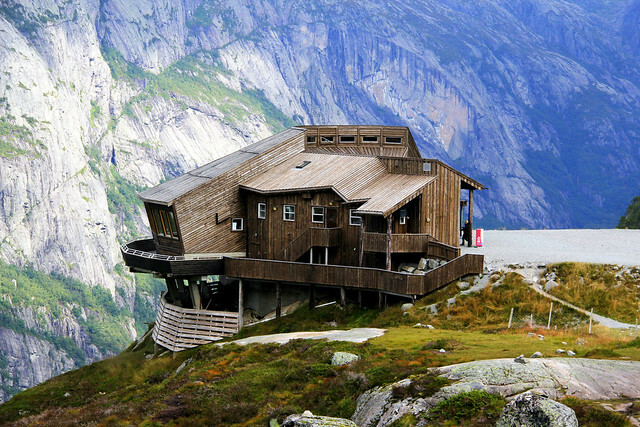 Oh wow, that drive looks terrifying and awesome all at once! Weather in Norway is definitely a bit like gambling - sometimes you will be grazed with the most beautiful sunshine and the next day big fog will envelop the mountains. Well, living in Bergen the latter is more probable! ;) I love mountain roads with tons of hairpins, because it's so adventurous, but I probably wouldn't be so impressed if I had to drive myself or were afraid of heights! I don't mind heights, but I get badly travel-sick and I am not a big fan of driving on cliff roads. However, for the (clear day) views, I would consider it. Providing someone else navigates the hairpin bends!